Administrators are dedicated to accessing the Local Manager administration service. They cannot be used for file transfer operations. In order to simplify configuration management for a large number of administrators, the administrators are associated to a role. This allows, for example, to easily disable access for all administrators associated to a particular role by simply disabling the role instead of having to disable every administrator. The roles represent a collection of permissions for Local Manager administrators that can be individually turned on and off. Roles can also be associated to operating system groups. In this way, you can allow access for administrators defined in operating system groups, e.g. using a Domain Controller or other centralized identity management systems, just like you would for an application-level administrator. A role can be shared between operating system groups and application-level administrators. The name role is used to avoid confusion with groups of regular accounts. Roles can be added or changed via Local Manager below. Adding a new role is done by creating a new section inside the configuration file. The name of the section should be prefixed with roles/ and followed by the role’s UUID. The role’s UUID can be any unique string used to identify the role. Once defined, the UUID should not be changed. For more information, please see the dedicated UUID documentation. description = Administrators having unrestricted access to Local Manager. 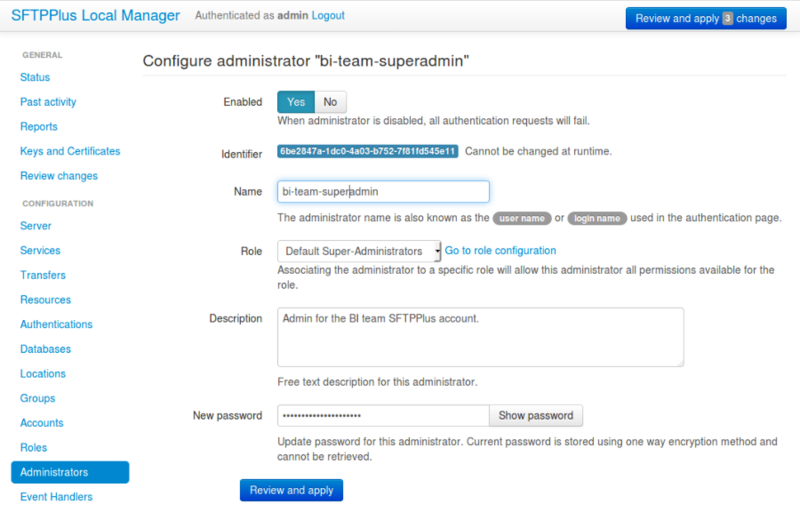 Administrators can be added or changed via Local Manager below. Adding a new administrator is done by creating a new section inside the configuration file. The name of the section should be prefixed with administrators/ and followed by the administrator’s UUID. The administrator’s UUID can be any unique string used to identify the administrator. Once defined, the UUID should not be changed. An administrator can be an application-level account defined for accessing the Local Manager or a local operating system account belonging to an operating system group associated to a role. An administrator can be associated with a single role. description = Administrator account for our super admin. administrators that are used for multiple roles. In this case, the result is undefined. This option specifies whether or not to disable access for all administrators. If the administrator is disabled, Local Manager will show an authentication failed message if login is attempted. Name of an existing group defined in the operating system. Human-readable short string used to identify this role. Human-readable text that describes the purpose of this role. The following configuration options are available for administrators. This option specifies whether or not to enable access for this administrator. Any alphanumeric string including space , _ or - . Human-readable short string used to identify this administrator. It also represents the login or username value for this administrator. Human-readable text that identifies the person or entity to use this administrator account and/or describes the account’s purpose. description = Administrator from the SA team. Password encrypted using a one-way cryptographic hash function. This option specifies the password used for validating the credentials for this administrator. It is stored encrypted using the cryptographic hash function SHA-256. To get the hashed password please check how to generate encrypted passwords using admin-commands. When the password is set to Disabled or left blank, the administrator will not be able to authenticate, even if the enabled option is set to yes . Clear text passwords are not supported for administrators. UUID for the role associated with this administrator.